Microsoft Dynamics CRM Online Spring ‘14 and Microsoft Dynamics CRM 2013 Service Pack 1 (SP1) have many new features and updates for your CRM deployment. Some of these features are optional and are disabled by default to prevent disrupting your CRM experience. However, you can enable these features by installing the product updates, in Settings > Administration > Install Product Updates. Installing product updates is a one-way process. Once installed, the product updates can’t be uninstalled. When you click or tap Install Product Updates, you install all the features included in the product updates for this release. So, be sure to carefully review the new features before you enable them. Test the effects of the new features on your organization before you roll them out to production. For testing, use a test instance of your organization if your deployment is on-premises, or a sandbox instance for CRM Online. More information: Establish the test environment, Manage Microsoft Dynamics CRM Online instances. Learn about the new features included in product updates for this release and why should you update: What's new in CRM Online Spring '14 and CRM 2013 Service Pack 1, What's new in customer service and Get ready for the next Microsoft Dynamics CRM release. Once installed, Microsoft Dynamics CRM 2013 Service Pack 1 can’t be uninstalled. 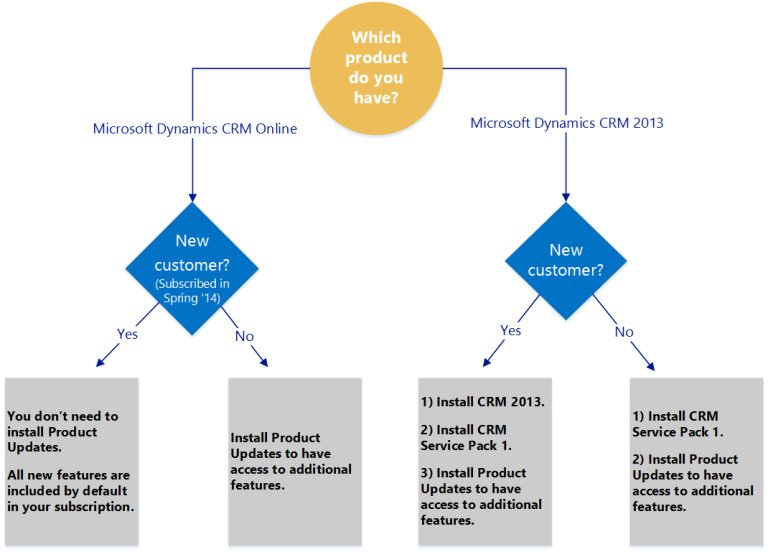 Read important information about Microsoft Dynamics CRM 2013 Service Pack 1 (SP1) before you deploy this service pack to a production environment: Microsoft Dynamics CRM 2013 Service Pack 1 and CRM Online Spring '14. Some of the new functionality is not added to your non-customized views until you install product updates. More information: Product Updates Installation Information for Microsoft Dynamics CRM Spring Wave '14. Installing product updates may affect certain behavior and customizations in the views, dashboards, forms, ribbon and sitemap. More information: Product Updates Installation Information for Microsoft Dynamics CRM Spring Wave '14. You can’t install product updates using CRM for Outlook or programmatically. The new features, installed when you click Install Product Updates, are enhancements in the customer service area. They will improve your user experience and let you configure service related features in one place. You’ll notice new functionality added to the existing forms, such as Case, Queue and Queue Item. You’ll also find several new entities, such as entitlement, social activity and social profile. The entitlement entity specifies the amount and type of the support you receive. The social activity entity is used to convert a social post into a case. The social profile entity contains information about the social media post and the author of the post. Learn more about new customer service features: What's new in customer service, What's new in this release and Get ready for the next Microsogt Dynamics CRM release. The diagram below is a roadmap for installing Product Updates. Are the product updates installed by default for my organization? The following table shows whether or not the new customer service features are enabled in your CRM organization. Before you begin to install the optional product updates, you’re given an opportunity to go to What's new in this release to learn more about the new features that you’re about to enable. On the nav bar, click or tap Microsoft Dynamics CRM > Settings. Settings appears on the nav bar. Click or tap Settings > Administration. Click or tap Install Product Updates > Update. During installation, you’re updated on the progress and notified when the installation is finished. If the product updates were previously installed, you’re notified that you already have the latest updates in your system. All new entities and attributes are added to your CRM system, regardless of whether or not you install the optional product updates. The descriptions of entities and attributes appear as “For internal use only.” in Microsoft Dynamics CRM 2013 Service Pack 1 (SP1) and Microsoft Dynamics CRM Online Spring ‘14 until the optional product updates are installed. After these updates are installed, the entity and attribute descriptions are updated in the metadata. Using the entities and attributes that are marked “For internal use only.” is not supported and may lead to unexpected behavior.